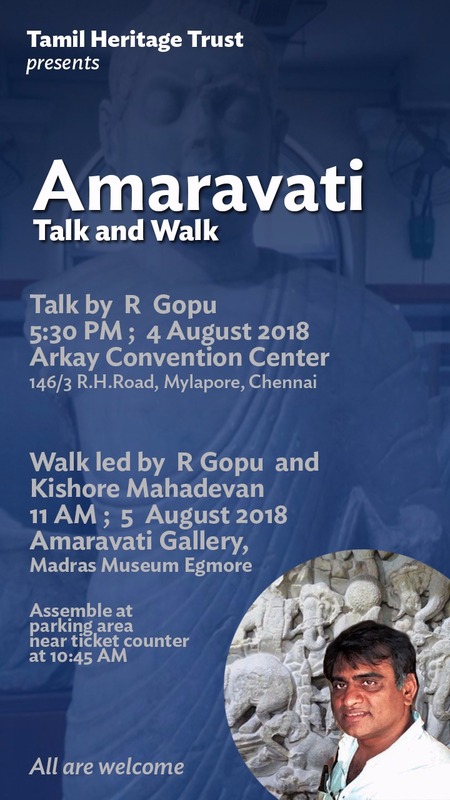 The talk is followed by a Walk in Amaravati Gallery, Egmore Museum, Chennai on 5th August 2018 at 11 AM. The Amaravati gallery is one of the great treasures of the Madras Museum in Egmore. Sculptures, pillars, and fragments of a Buddhist stupa dating back to the second century BC, from an abandoned city of the Satavahana era, were brought to this museum in the middle of the nineteenth century, perhaps saving them from destruction and misuse. It is a mystery, that the Amaravati gallery, whose sculptural splendour is equal merit to Ajanta, in the middle of a massive city, easy to behold and easier to access, does not draw far bigger crowds. Perhaps the unfamiliarity of its themes and seemingly confusing compositions are a challenge to the lay public and connoisseur alike. The art of Amaravati is not only astounding; it is of great artistic, religious, historical, epigraphical, and aesthetic value. It is the earliest lithic work any significance in the southern part of the Indian peninsula. Even this earliest attempt exhibits an astounding creative maturity and represents the perfection of the art of sculpture. The panels are among the finest examples of Buddhist art, few remains of which are still to be found in South India. The sculptor possessed masterly knowledge of composition and an intuitive sense of balance and sequencing. For the first time, several techniques of artistic rendering such as lighter and deeper etching, differentiated planes, perspective and distance, and foreshortening are successfully introduced. It is not possible to describe the variety of the panels or the various aspects listed above, in a single lecture. Or even a couple of hours of strolling through the gallery. But an introduction to its history and a brief explanation of a few selected panels may help. Hence this talk at Tamil Heritage Trust and walk with the cooperation of the Madras Museum. Rangarathnam Gopu, having been born and brought up in Chennai, obtained his BE in Computer Engineering from Arulmigu Kalasalingam College of Engineering (now a deemed university) in Srivilliputhur and an MS in Computer Science from the Texas A&M University in College Station, Texas, USA. He then worked in the US, as a software engineer, mostly at Microsoft in Seattle; but also brief stints at MicroAge in Arizona and Decide.Com in California. Bored of software, he returned to India to pursue a career in writing and screenwriting. But his interest turned to other directions, like Art, History, Music, Heritage, Astronomy, Evolution, Genetics, Economics etc., He reads, lectures writes and blogs on these subjects regularly. He has been part of Tamil Heritage Trust close to a decade and his contributions to organising Monthly Talks, Pechchu Kachcheri, Site Seminar, Mallai Study Tours are immense and invaluable. He has been part of Adyar and Cooum Cultural Mapping groups too. He received Vedavalli Memorial Heritage Award for Services to Culture in 2016, instituted by Ramu Endowments associated with TAG group. He is part of the group that founded the VarahaMihira Science Forum which has been conducting monthly lectures on science and scientists since August 2017. He delivered the forum’s first lecture, on French chemist Antoine Lavoisier and the Origin of Modern Chemistry.